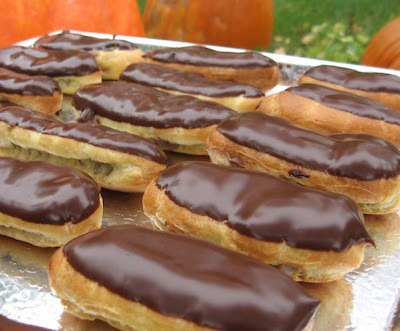 As I spent over 6 hours in the kitchen preparing and cleaning up after my French fantasy, Éclair making, I came to a realization. The French do it better...... Period. How is it that something so small and seemingly innocuous could be such a labor intensive, sweat inducing, curse worthy sweet to make? Why?...... Because it is French. 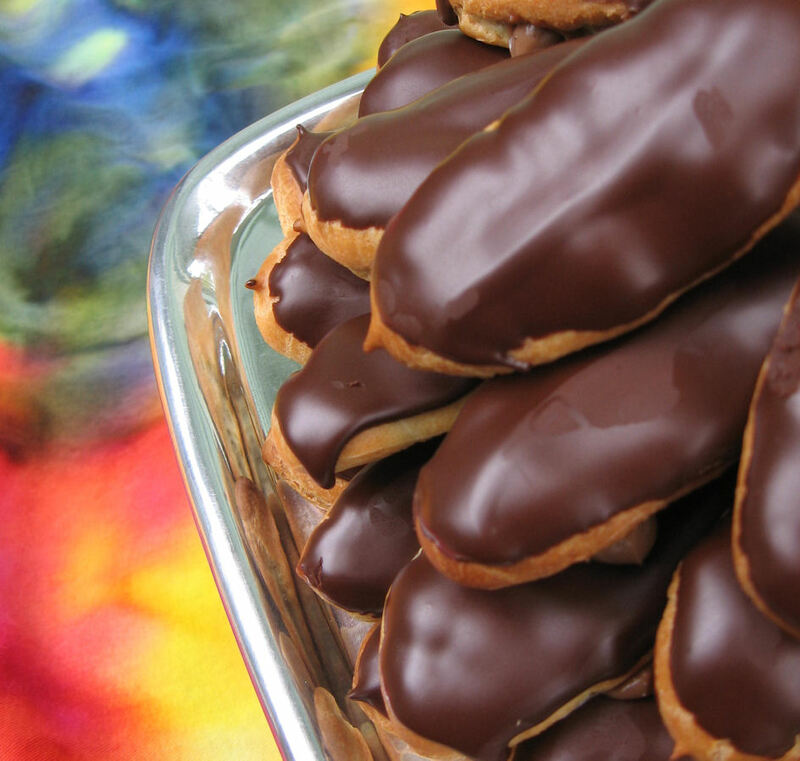 Do you know what éclair means? It means, flash of lightening. They sure lived up to their name when I served them last evening at a party. As soon as they were on the table.... they were gone, in a flash! Even though this round of the competition supposedly is "bypassing the French and Italian Standards", there is nothing standard about these. Bypass the French...Sacré bleu! I have never ventured into French pastry making, so for me... this is totally new ground. I have made sesame ladoos from India, chicken mole from Mexico and homemade mochi from Japan, but I have always held French Pastry Making at an arms length. It just always seemed too difficult..until now. I decided to embrace French Pastry making, specifically petite éclairs. Why? Because the French do it better, that's why. Their precision, attention to detail, design and beauty is second to none. I shy away from lengthy recipes that seem "complicated and confusing". I tend to lose my focus quite easily, so taking on a 3 step French pastry recipe demanded all of my attention. I like to be tested, to see if I can accomplish what I previously thought was impossible. And tested I was as I set out to create these delicious, bite sized, French pasty treats. My little femme fatales.... irresistible to all! 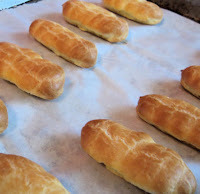 For the first part of the recipe, I made Choux Paste or as the French call it...pate a choux. This really turned out to be a divine little pastry dough that I am looking forward to using again. The recipe is quite simple... but if never done before... make sure you read the directions a few times before making the dough. I learned that is feels so much better to be able to anticipate the next step in a recipe, rather than scrambling in the moment and potentially botching your recipe. 1) Place milk, water, butter, salt and sugar in pan and bring to a simmer. Turn off the heat, yet leave pot on stove. 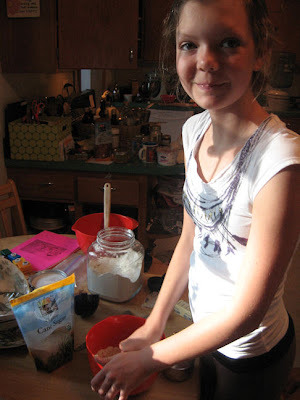 2)Pour all of the flour into the liquid and mix with wooden spoon. Tun heat back on to medium and, stirring constantly until the dough is smooth, and pulls away from the side of the pot. 3)Pour dough into large mixing bowl fitted with the paddle. Mix on low speed, adding 1 egg at a time. Be sure to scrape the bowl in-between additions. 4) Before adding the last 2 eggs, check the consistency of the dough. It should give a bit and pull away just a bit from the paddle when you turn it off. If mixture is still stiff, add another egg. 5) If not using right away, place dough into container and cover dough surface with plastic wrap so a crust does not form. 1) Oven at 400. Line 2 baking sheets with parchment paper. Place a bit of the dough paste under the corners of parchment to keep it in place. 2) Get our your pastry bag and a 3/8 inch tip. Fill pastry bag with dough. Pipe 3" inches long, 1 inch apart. 3)Take wet pastry brush and brush the tops of the dough before going into the oven. 4)Into the oven for 13 minutes...at 13 minutes, prop oven open with a wooden spoon (to let steam escape) and continue to cook with door propped oven for another 9 minutes. This timing may vary. This is what worked for me. 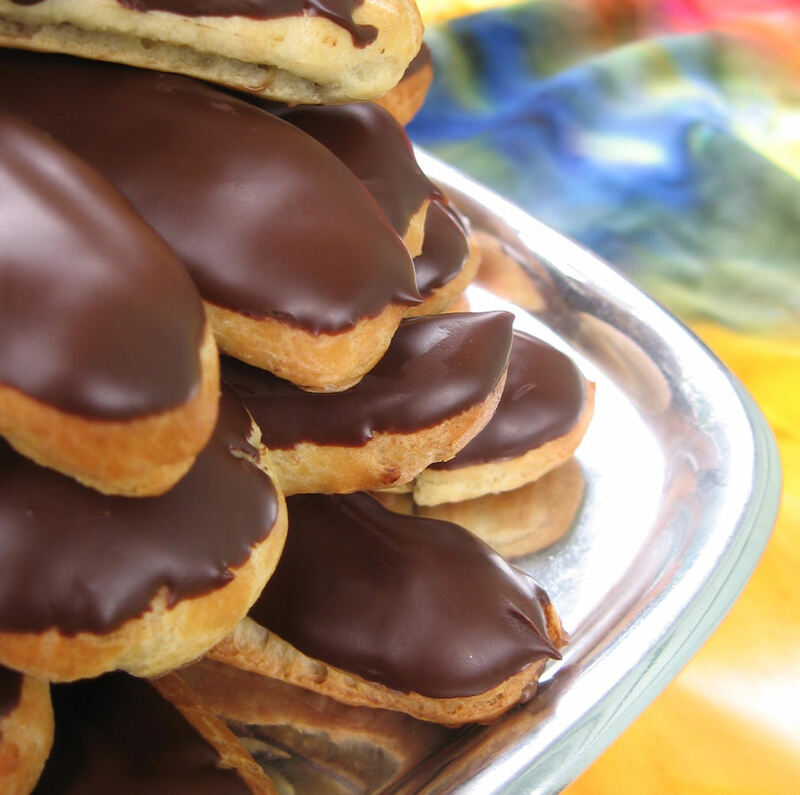 You prop the door open when the eclairs have fully expanded or "puffed" up. 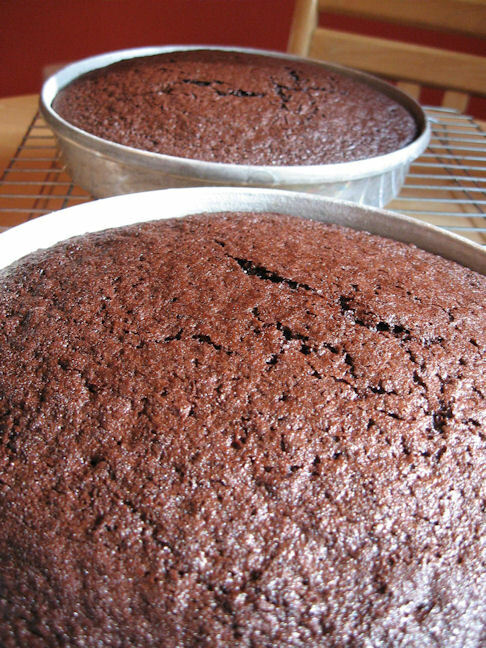 5)They should be ready to come out of the oven at this time. Cool on racks. Attempt #1 = eclairs gone wrong....(did not follow directions) Do as I say.... not as I do! 1)Bring the milk, half the sugar and the vanilla bean to a boil in a heavy bottomed saucepan. 2)In separate bowl whisk the egg yolks and sugar until the mixture is a nice pale yellow. Sift the corn starch and flour over the eggs, whisking in until there are no lumps. 3)When milk begins to boil, pour 2 cups of liquid into the egg mixture to temper the eggs. Change the heat to low. Add egg mixture back into the milk mixture, again whisking like mad until the mixture begins to simmer. 4)Pour custard into a large bowl, pull out vanilla bean, add vanilla extract and butter. Whisk again. 5)Add 1 TBS hot water to 1 TBS espresso powder, dissolve and whisk into cream. Whisk chocolate into cream and stir until chocolate is melted. Cool to room temp, and refrigerate until ready to use. Filling the Pastry Shells- The fun part! - I really felt French when I whipped out the pastry bag! 1)Take a sharp piping tip, or use the one you used for piping the pate a choux, and poke 2 little holes in the side of the pastry shells or on the bottom. Leave about 1 inch between the holes. 2)Fill pastry bag with your pastry cream and insert the tip into the holes. Fill with cream until you feel the little Éclair shell start to give a bit. If you over-fill the éclairs, you risk the chance of breaking through the pastry shell, and then being forced to eat one of your éclairs early... darn. The last step in this wonderful process was glazing the petite eclairs. I used a delicious chocolate glaze that was a bit tedious because you had to clarify your butter first. Luckily, I have made clarified butter several times, so it was not too much of a setback. It was all worth it as the chocolate set beautifully with a wonderful smooth shine. By the time I was to this point in the recipe, there was no going back, only the sense of accomplishment waiting around the corner.... a lovely eclair, waiting to be eaten! 2)Melt chocolate in a heatproof bowl set in simmering water. Stir chocolate until just about melted. Take off heat and continue stirring. Do not let chocolate get too hot.... it should just be barely warm to the touch. 3)Pour in butter and corn syrup, whisk until smooth. Place in container and get ready to dip those eclairs! The delight of this wonderful dessert was the pleasure I had in eating one after so much time and trial and error in the kitchen. Zut alors I proclaimed as I sunk my teeth through the delicate pastry shell into the creamy middle! 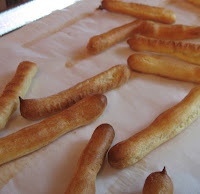 Do you recall the photo above of the éclairs "gone wrong"? 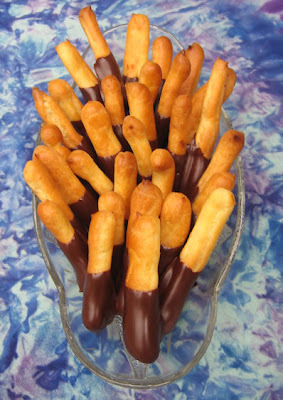 Well I did not want to waste the dough and I had just enough chocolate glaze left, so I dipped them in the chocolate and made "Petite Sticks". They were wonderfully delicious. They too disappeared quickly from the party last evening. "petite chocolate sticks".... proof that you can find good in every bad situation! I stretched myself again. Without change, there is no growth. I tried new things, read lengthy recipes, followed the directions (most of the time) and made something I thought one only finds in the window of patisseries around France! Voila! I can do it at home! 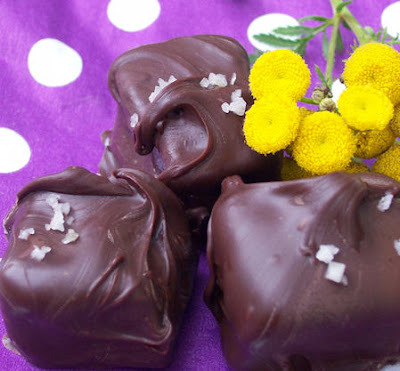 Chocolate-covered Caramels Recipe (by request) and Vote! After yesterday's "French Themed" post without a recipe (and several requests), I stopped by my sister's home to pick up the cook book that I so absentmindedly left there. It was a good thing that I stopped by, for her gargantuan dog Arlo, had somehow managed to pull a Houdini and escape out of his crate and happily eat the entire toe off of my sister's black sequined ballet flat. So much for being cute and French with those little ballet flats. Sianara sparkle! 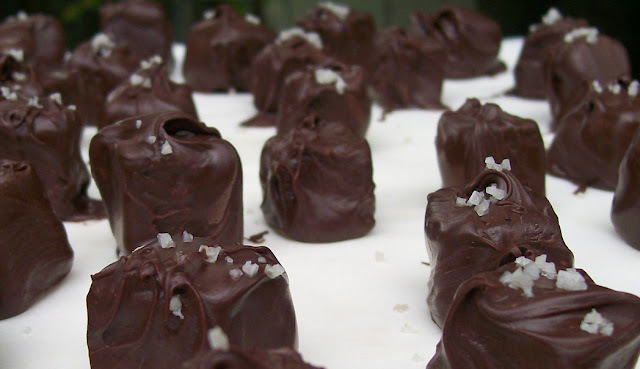 Today, I bring you the recipe for Chocolate-covered Chocolate Caramels. The work and love you put into these is quite worth all of your focus and attention. You will enjoy your caramels for days afterward, and so will your family! 1.5 cups whipping cream - Organic Valley Preferred... once you have used their cream you will never go back. 10 ounces extra bittersweet chocolate, finely chopped. I used Ghiradelli, Baking Chips - 60% semisweet, not need for chopping here - These were wonderful! 6.5 ounces milk chocolate, finely chopped. Again I used Ghiradelli Milk Chocolate Chips, no need for chopping. 1) Bring the cream to a boil in a small saucepan. Cover and set aside. 2) Put the sugar in a deep, heavy bottomed stainless steel saucepan. Add the corn syrup and 2 TBS of water, stir with wooden spoon to wet all ingredients. Do not stir to dissolve. 3) Begin heating the sugar over low to medium heat. Wash any crystals that are clinging to the inside of the pot into the rest of the sugar, using a wet pastry brush. Keep doing this throughout the process. Heat the sugar, with out disturbing the pot until sugar begins to boil clear. 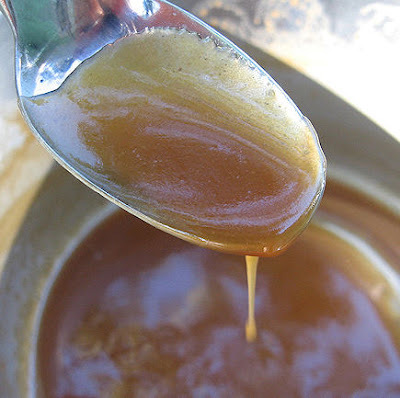 Once sugar boils clear, swirl the pot from time to time to distribute the heat within the syrup. 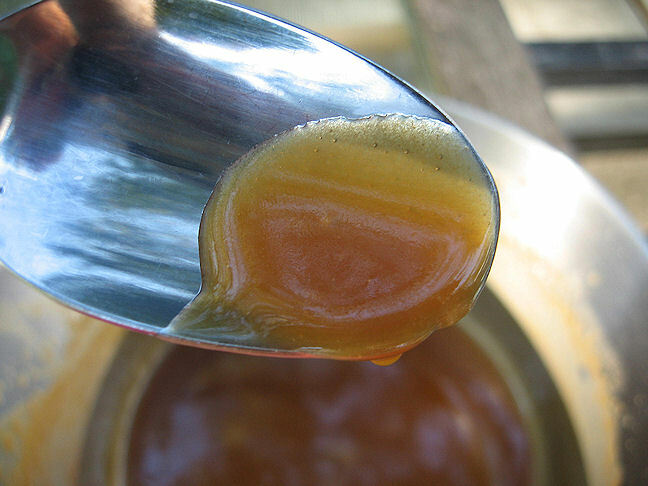 When the sugar begins to take on a light amber color, watch it carefully and swirl the pot often. It will go to a deep caramel within a few minutes. Once the caramel has reached 370, turn off the head and quickly and carefully whisk in the hot cream. Whisk vigorously with a long handled whisk. The mixture will bubble up, be careful. 4)Put bittersweet and milk chocolates into a large mixing bowl, then pour the caramel cream mixture over. Let stand for 3 minutes to melt the chocolates, then whisk until smooth. Whisk in butter until no streaks remain. Cool to room temperature. 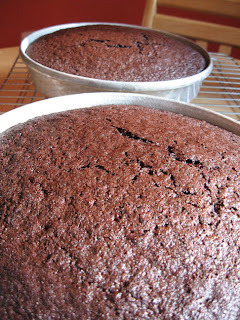 5)Line a 9x9 cake pan with foil, careful not to wrinkle the foil to much. 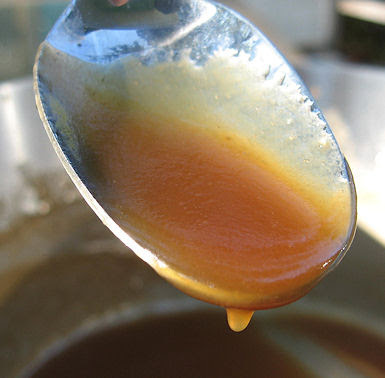 Pour caramel mixture into the pan and refrigerate until firm, this will take about 2 hours, maybe less. My experience was 2 hours. 6)Lay parchment on top of cutting board. Flip out the caramel mixture onto the parchment. Carefully take off the foil. 8)Get yourself a nice long butchers knife and a nice large bowl or vase of hot water and paper towels. This assists in the cutting process of the caramels. 9)Begin slicing the caramel mixture, about 1" rows. Then proceed to cut the rows into smaller 3/4 inch pieces. Place in parchment lined Tupperware. Save until you are ready to cover with chocolate. 10)Caramels need to be at room temperature when ready to be covered with chocolate. 11) Place the bowl of tempered couverture in front of you. Have a large cookie sheet lined with parchment next to you as well as fine grey sea salt. 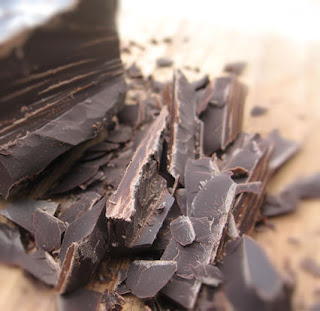 If you have never worked with tempered chocolate...please watch this video, it is very helpful! Follow the directions she gives. 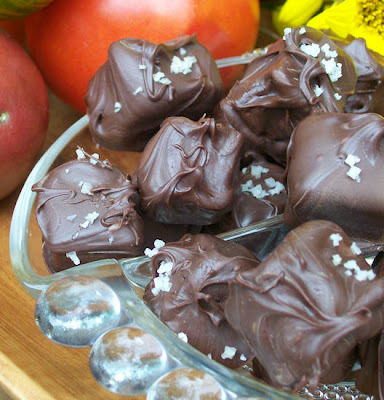 12)As you dip your chocolates, be ready or have a helper ready to sprinkle sea salt on the chocolates before it sets. I used a plastic glove for dipping the chocolates, it was helpful and kept my hands clean. 13)After chocolates are set, place in airtight container at room temperature. 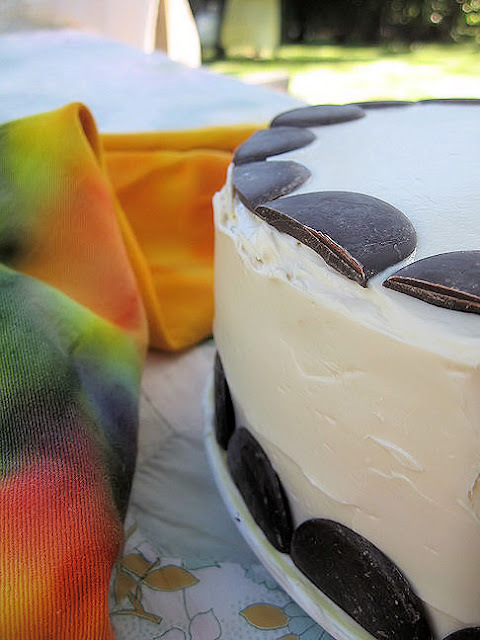 Use wax paper between layers of chocolates. Voila!@! Foodalution Entry in Project FoodBlog! I have been having so much fun with this fabulous new cookbook called, The New French Baker by Sheila Linderman. Her recipes are divine, exact, descriptive, quite scientific and very French. Their can only be one explanation for why French pastries and sweets are just so...perfect, they must follow the recipes! I am so Not French. Everything about me screams the opposite. I tend to converse while cooking, my ADD can go into overdrive, I loose my place in the recipe... and before you know it, I have pushed the recipe aside and just end up doing my own thing. I have learned that this definitely does not happen when one is messing around with FRENCH food. 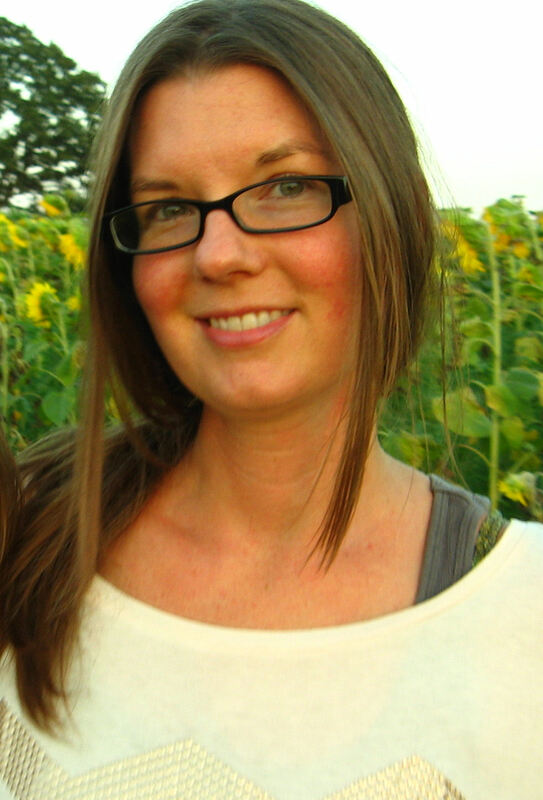 My sister Molly, from The Well Rounded Table, and I were going to have a day of cooking. French pastries and chocolates were the theme. More specifically, croissants and chocolate covered caramels. Somehow, I managed to hand off the 3 page croissant recipe to my sister... and I was stuck (not complaining) with the caramels. While I was knee deep in chocolate, Molly was rolling about the détrempe. The poor thing....she toiled (willingly I might add) for three days with the dough while I boiled sugar until it became the color of amber. Today, we spent six hours pretending we were French, drinking wine with our lunch, proofing dough, tempering chocolate and eating like queens. Needless to say, it was a wonderful day. I left the recipe book at my sisters (hence no recipe today), along with my coat, extra caramels and other important items. I bet if I was French I wouldn't have forgotten them. So for now... I leave you with just mouth watering images of deliciousness. Thank you to all of you who have supported me during this first round of Project FoodBlog! It has been so much fun! Remember to vote! 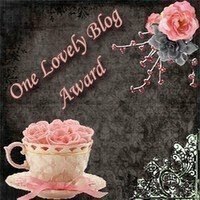 And a big thank you to sweet Kristy at My Little Space for gifting me the Lovely Blog Award. Kristy is one of those amazingly talented, funny, and kind persons that leave you feeling better about yourself and the world! Thank you Kristy! Cooking keeps me sane, it is the molasses in my life, slows me down and keeps me sweet. Do you see this cake? Do you see it's layers of loveliness? 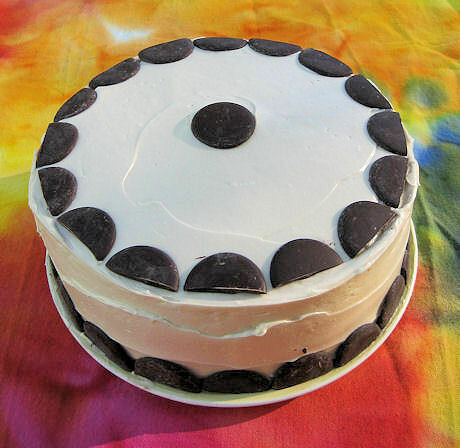 If you would pick this cake apart, layer by layer, ingredient by ingredient, you would see a slice of me. A bit of caramel that goes with the flow, chocolate for sass, butterscotch to help me remember my roots (I do have some Scottish in me somewhere), cream cheese to remind me that life takes on all shapes and sizes, butter to remind me to be sweet, salt for when life gets tough and most of all ♥♥♥ Love. Those of you who have been with me since the beginning of my blog know that love... is my single most important ingredient. No matter the recipe, my heart is always present when I am in the kitchen, my mind stops racing, my breathing calms..., I focus (and have a glass of wine) - cooking becomes my meditation for life. It is the activity I do every day that keeps me centered, sane and present. I share my food and love with those around me, letting myself be inspired and going with my personal passion. This blog has brought me to a new place in my life. With every post, I grow. What more could I ask for? Without change, there is no growth. I create and serve food that makes me smile and those around me smile too. Eat good food and do what you love, that is my motto. Make it with love and give it away..... it will all come back to you in the end. Beginning this blog was the best thing I could do for myself. Foodalution=evolution .... watch me grow! Now enough about me and on to that cake! This chocolaty, caramel, butterscotch cake is for my mother. This is the one cake she is always, 100% of the time, in love with (my sister too). How to please your mother, we always wonder don't we? I have found the answer, make her this cake! 1 cup hot (not boiling) water with 1 TBS instant espresso powder dissolved. In large mixing bowl whisk together your dry ingredients except your cocoa powder. Sift your cocoa powder into the other ingredients and whisk again. Attach mixing bowl to mixer with paddle attachment. Add butter and eggs and mix slowly until moistened. Add buttermilk and mix for a minute. Add hot water and mix again for about 1.5 minutes. Measure the batter and pour, cup by cup into prepared 9" round pans. Measuring the batter will help keep the cakes even. Bake at 350 for 30 minutes. Test for doneness. Let cool. Slide knife around edge of pan after 10 minutes and tap out cake onto cooling rack. Let cool completely. 2 sticks unsalted butter, softened. 1 recipe worth of Homemade Butterscotch Sauce - room temp. Cream butter and cream cheese until very smooth. Add in sugar and a dash of salt. Cream ingredients again, you will want all the lumps out of your frosting. Add in the Butterscotch Sauce. Mix again until blended. If using right away, leave out. Otherwise, refrigerate in sealed container. Take out at least 2 hours before frosting. You want it to be quite spreadable, like mayonnaise, when frosting. 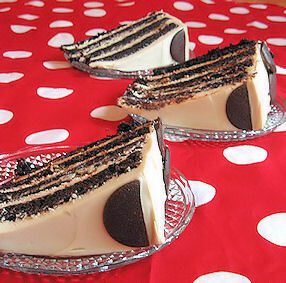 Slice cake layers in half. Place first layer on cake plate. Spoon caramel onto the cake layer, spread over the entire layer, leaving a 1"2 inch space from the edge. Place layer into freezer for 10 minutes to firm up the caramel. Pull out of freezer and spoon on the butterscotch cream cheese frosting. Spread out over caramel. Do not worry if the caramel and cream cheese frosting mix. It will give it a tye-dye frosting effect. Repeat with the next 2 layers. Put on a crumb coat, place in fridge for at least 40 minutes and then apply final coat. Decorate as you wish. Enjoy your cake with a smile on your face! My official link to Project FoodBlog is here. Voting Open: 6am PT September 20 - 6pm PT September 2. ♥♥♥ I would appreciate your vote! That is an understatement..... I would REALLY LOVE your vote! I am usually not a fan of contests, but this one is pushing me outside of my comfort zone... and guess what? I love it! This post is going to piggy back on a future post of mine. I made these sauces for an upcoming cake. Yes, a cake that will be smothered with butterscotch cream cheese frosting and layers of caramel sauce. Putting the cake together requires time and patience, so I figured we better start with what can be done ahead of time. For the moment, Pick your Poison! 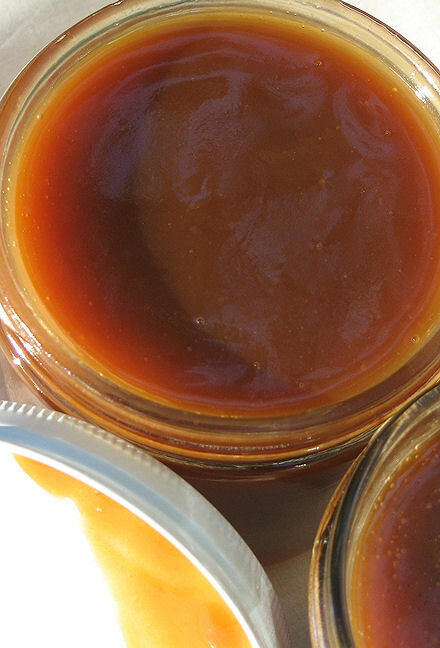 For those homebodies out there who want to curl up in the corner of your couch with a delicious book and a scoop of ice cream, choose the caramel sauce recipe. 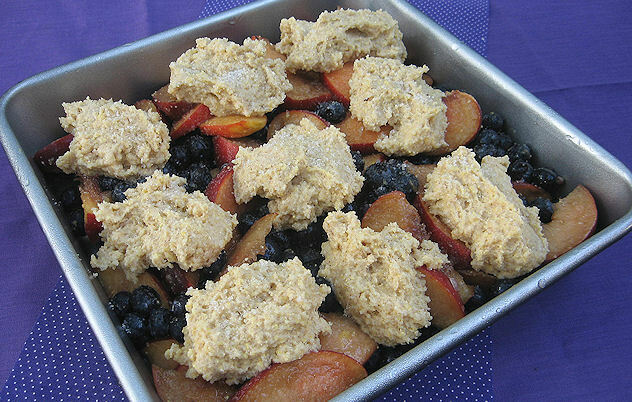 For those who wish to be whisked away to a cottage by the sea, wrapped up in a cozy aran sweater and eating warm bread pudding, choose the butterscotch sauce recipe. Both indulgent. Truthfully, neither need the ice cream or the bread pudding to be eaten... just a spoon! Enjoy the following recipes below. Prepare now so you will be ready for the cake recipe that goes with these! In a heavy bottomed pan, place sugar, water and corn syrup. Heat over medium until sugar is dissolved. Let the mixture simmer, little bubbles will be fine. Cook mixture like this until it turns a lovely dark amber. Think like the amber you see in jewelery. Remove from heat and immediately and add cream, butter, sour cream, salt and lemon juice. Whisk vigorously, let cool briefly and pour into a glass container for storage in refrigerator. In a heavy bottomed pan, place sugar, corn syrup and butter. Let the sugar and butter melt, stirring constantly and let it get bubbly/boiling. Let mixture cook like this for about 3 minutes. Add in the liquor, mixture will bubble, stir vigorously. Add in cream and dash of salt. Stir vigorously again and let simmer for another 2 minutes. Take off burner, let cool and pour into a glass container for storage in refrigerator. 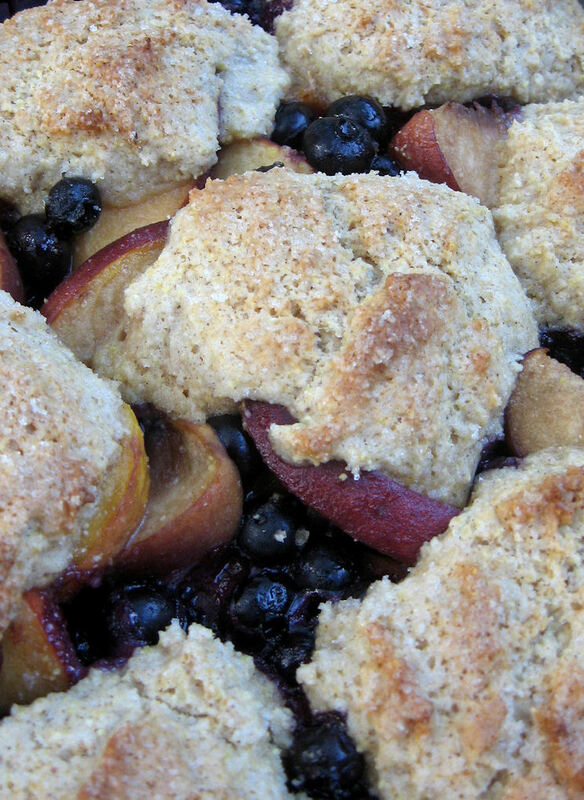 Blueberry Peach Cornmeal Cobbler.... The 13 year old Bakes! Taa Daa! My daughter made this! For months I have been whipping it up in the kitchen, hoping that my daughter or son would become inspired and want to actually create instead of just partake of the food I make. The moment finally arrived. (ahhhh... angels sing) However, I have been quite consumed with the busy-ness of a new school year, and sadly, my blogging entries have dropped to a standstill. It truly does depress me as there is nothing I like more than cooking (anything) and writing about it. Foodies know....blogging makes us happier. Right? So since my anniversary cake post... there has been nothing.... zip, nada, zilch... until now! Gosh how I love my daughter. I love her even more when she requests to make something for supper (especially something sweet). Not only did she make this all on her own, if I even offered up a whisper of help..... she declined and in a very loud "teenage" voice declared, "I am doing this myself. Stop helping me!" Needless to say, the hovering cook, baker and mother in me backed off. My husband was given a huge load of beautiful Michigan Blueberries from a dear friend at work. Thank you Kathleen! He brought them home as a surprise, until he realized how much work it was to clean and freeze all those berries. 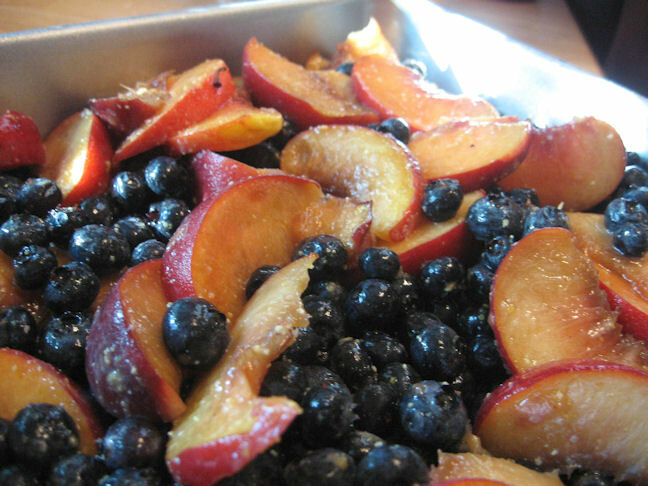 Complaining aside, we had several peaches sitting around and lots of blueberries. Hence a cobbler was born! Vimala worked and worked until she had it just right. She is even more a perfectionist than myself. See for yourself as you look how evenly spaced her cornmeal dollops were placed. I tend to be a bit...careless sometimes (shhhh) but not dear Vimala. The recipe came from somewhere on-line.... I am sorry as I can't find the source now, and neither can she! There she is.... cooking away. Preparing of lovely warm, juicy cobbler for the evening! Set oven to 350. Mix above ingredients in a large bowl and place in buttered 9x9 pan. Prepare cornmeal dumplings as directed below.